That would explain why no other newsletter (at least not that I’m aware of) publishes an actual full year S&P 500 chart projection (2016 projection shown below). Accountability is an underrated (if not entirely ignored) concept on Wall Street. 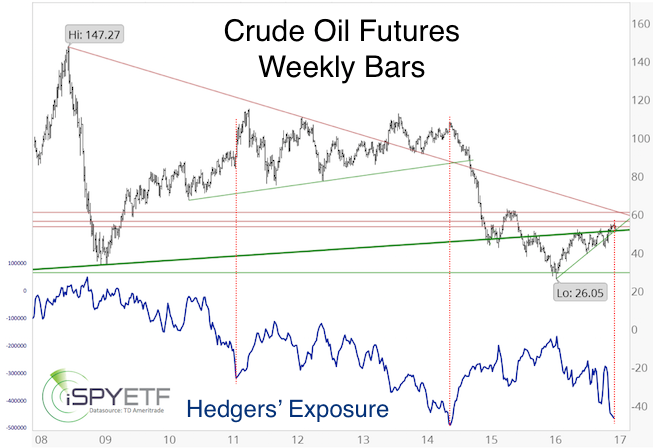 But what’s the purpose of following many time-tested indicators if we don’t put them to work? 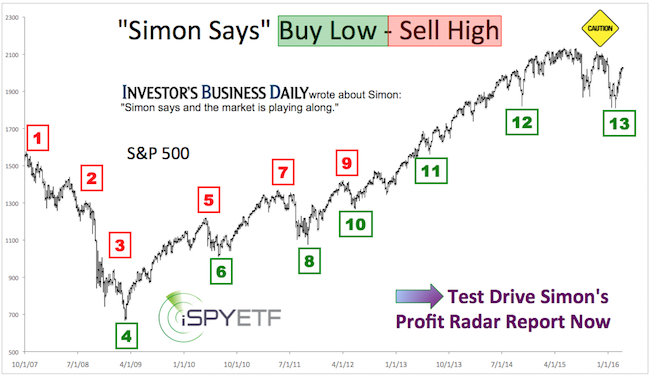 Subscribers to the Profit Radar Report deserve a straight-forward forecast. 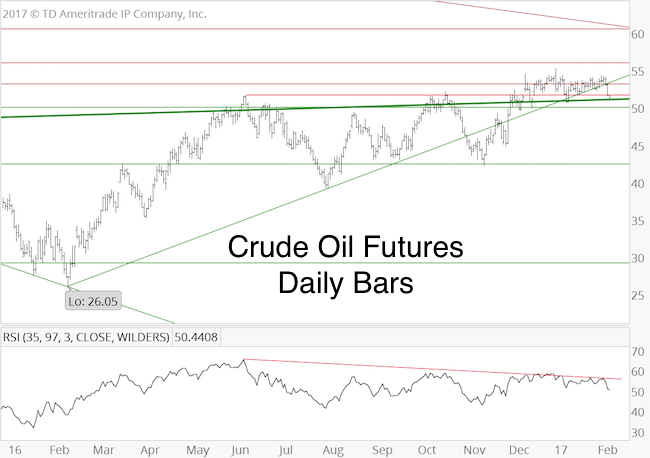 My goal is to provide a rough roadmap for the year ahead, based on what indicators are telling us right now. 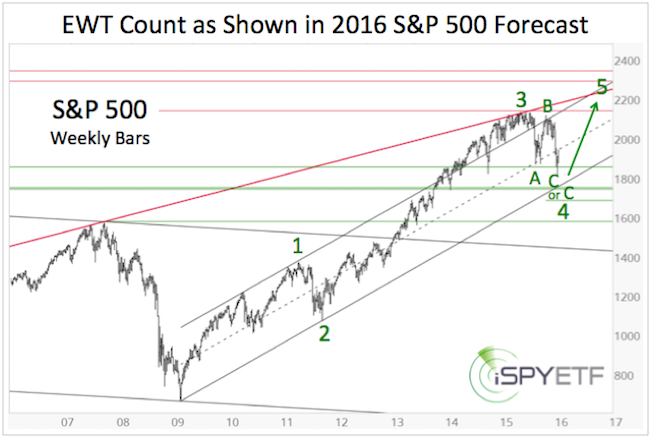 Before we get to the 2017 S&P 500 Forecast, here is a review of the 2016 S&P 500 Forecast, published on January 31, 2016. Below is a review (and small excerpt) of our 2016 S&P 500 Forecast, based on four key indicators (supply & demand, technical analysis, investor sentiment, seasonality and cycles). Each indicator/forecast is graded with a green pass, red fail or red/green draw symbol. At the time of publishing (January 31, 2016), our bullish 2016 outlook was truly contrarian. 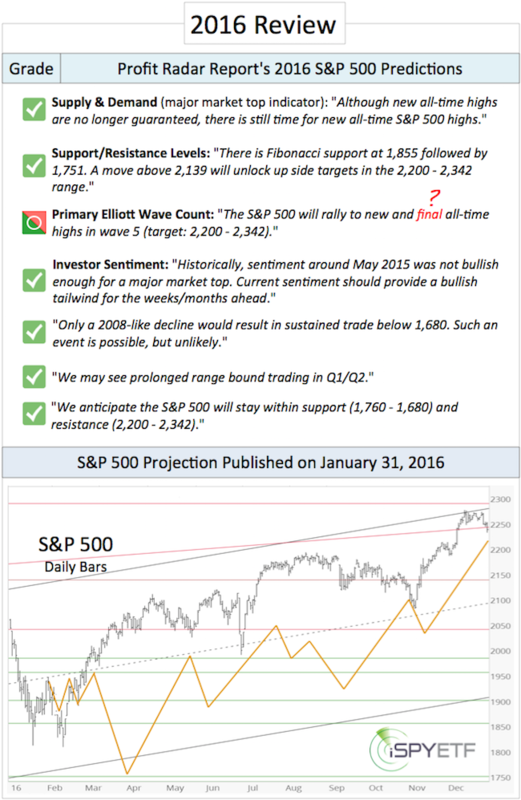 A more detailed version of the 2016 S&P 500 Forecast was published here. It wouldn’t be fair to re-publish analysis paid for by subscribers here for free, but I feel comfortable sharing a few key points. The 2016 S&P 500 Forecast featured this Elliott Wave Theory based forecast, which pointed to new all-time highs with a target around 2,290. Our major market top indicator confirmed the most recent S&P 500 highs. This means a major market top is, at minimum, months away. The up side target has been adjusted accordingly. In fact, the 2017 S&P 500 Forecast expounds on a more bullish Elliott Wave interpretation (which was first discussed in the August 28 Profit Radar Report). 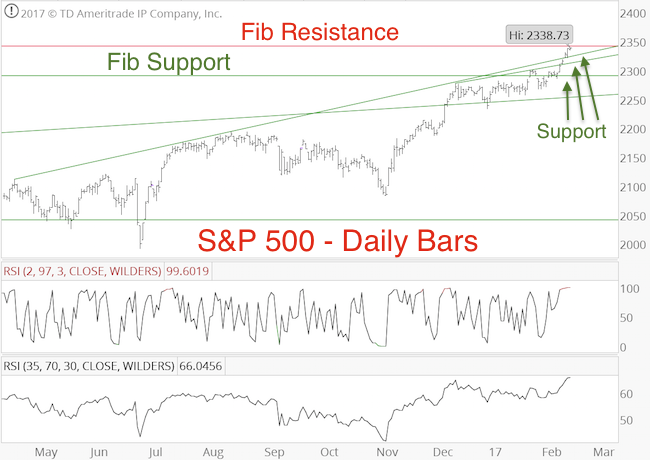 We will crosscheck the S&P 500 future S&P 500 pattern against our major market top indicators and investor sentiment (the 2017 S&P 500 Forecast includes a sentiment comparison between 2007 and 2017) to determine whether upcoming all-time highs will be a major top or not. Despite the bullish potential, and even if this bull market has (much) further to go, the S&P 500 is likely to suffer a 15% correction in 2017.